Patrick McComas, Director of Global Sales, visits an organic yerba mate plantation in South America. I had the awesome opportunity to travel to South America last month and meet our hard-working organic yerba mate growers. The trip not only included fascinating tours of the yerba mate fields and manufacturing facilities but also an education on the beloved tradition of drinking yerba mate and, of course, sampling of a plethora of yerba mate beverages! Yerba mate tea is very high in antioxidants. In fact, it has about 90% more antioxidants than green tea. Because of its high antioxidant levels, yerba mate is believed to have significant immune-boosting properties. Click here to read about them. While the caffeine yerba mate provides increases mental energy, clarity, focus and physical performance, it doesn’t cause any of the uncomfortable side effects such as headaches, stomachaches and jitters associated with drinking more common caffeinated beverages. A study by the University of Illinois links yerba mate to the prevention and destruction of colon cancer cells. Click here to read about the study. South Americans have long used yerba mate tea as a traditional herbal remedy against digestive ailments and to manage weight. Read more about how yerba mate helps manage weight here. Here you can see the large Pinheiro Araucaria trees towering over the yerba mate plantation. Our organic family farmers in South America have been growing yerba mate for over five generations. They learned from the natives over a hundred years ago and have been working hard to preserve the natural ecosystem for yerba mate ever since. For example, yerba mate needs to be grown in very specific soil with a healthy dose of shade. The Pinheiro Araucaria tree provides this vital shade that allows the yerba mate trees to thrive. I had the opportunity to harvest some mate by hand, learning how to carefully clip the leaves and branches without creating long-term damage to the tree. It’s also important to allow the yerba mate trees to grow in-between harvests. Over the generations, our farmers have learned to utilize a variety of harvesting techniques (hand, hand-trimmed, and hand-cut at various places and angles on the branches) to preserve the tree. They then wait two years before they go back to a tree they’ve harvested from. This ensures the yerba mate can re-grow and continue to provide a plentiful harvest as efficiently as possible. Maintaining a proper growth and harvest cycle also balances the flavor and nutritional value of the mate. The oven used to remove almost all the humidity from the air and the tea is extremely hot. After harvesting, the mate is loaded onto a tarp, wrapped tight and delivered to the processing facility where it is fire-dried using Eucalyptus tree logs in a gigantic wood oven. The heat produced from the fire passes through a large chamber containing mate leaves, drying them and taking the most of the moisture out of the air. The majority of the smoke produced from the wood-fired ovens is transferred through a chimney out of the facility and never reaches the yerba mate. The mate is then transferred to the mills where it is cut for loose leaf (gourd drinkers) or tea bags. During my trip I was able to watch three different types of yerba mate being processed: green mate, aged mate and roasted mate. Just a few of the various mate drinks I sampled. Green mate is simply freshly harvested yerba mate. It’s been recently picked (within days and commonly processed the same day it’s harvested) and is relatively untouched other than allowing it to be quick fire air dried, milled and packed. It tastes similar to a very subtle green tea. Aged mate is dried and stored for a few years (usually 2-4) before being consumed. The harvesting and processing is the same as green mate and simply stored for a few years before being consumed. When properly aged, some teas develop a whole new level of flavor (just like wine) and yerba mate is no exception. The aged mate has a beautiful nutty color and combines the flavors of green and black tea with natural smokey notes to create a lovely balanced refreshment. Even the gas man drinks yerba mate on the job! Roasted or Toasted mate is my favorite and is by far the most popular yerba mate in South America. It can be made from either green or aged mate and includes a roasting step – usually in a coffee roaster. The taste, I think, is unbelievable! Full of malty and caramel flavors, this is a full-bodied tea that’s perfect iced or hot. In South America, they drink it at all hours of the day in a variety of forms: iced with lemon, blended with lemonade, whipped into a latte, and more. I hope this little overview of yerba mate was informative and sparked your interest to give it a try. It’s found in most grocery stores in the tea isle or ready-to-drink beverage section. It’s also starting to show up in a wide variety of blends like Tazo’s Cocoa Mint Mate. I’d love to hear if you’ve tried it and, if so, your favorite way of enjoying this emerging beverage. If I can answer any questions about yerba mate or assist you in wholesale supplies, don’t hesitate to email me at info@hqorganics.com. Or, you can always post a question here or on our Facebook page. Patrick McComas, Director of Global Sales for High Quality Organics and tea expert. Patrick McComas has been with High Quality Organics for over 3 years. He began as a Senior Buyer with our Supply Chain team and evolved into sales after a few years. His breadth of knowledge on all ingredients – especially tea – makes him a vital asset to HQO and a fascinating dinner guest! When Patrick isn’t sharing the latest details about an uber exclusive tea plantation in the remote hills of Sri Lanka, he’s creating some amazing music with his bands. Patrick was a manager in the early Northwest Micro Brewery scene, including the first certified organic Brewery, Laurelwood, earlier in his career. His love for teas and spices began when he would work experiment with spiced beers, or create his homemade hot sauces. (Beware of his ghost chili sauce; homegrown and beyond hot!) Patrick is married and the proud father of an 18-month old who keeps him laughing after even the hardest days at work. Peru, a small country on the northwest coast of South America, is known by many as the home to one of the Seven Wonders of the World, Maccu Picchu, or the birthplace of America’s beloved vegetable, the potato. If you’re a foodie, you’re probably aware of the soaring popularity Peruvian cuisine is having on restaurant menus around the U.S. However, what we find most exciting about Peru is the pristine countryside where farmers have been growing organically for generations. Click on the image to read more about Peru’s organic agriculture in this white paper. While Peru has no shortage of organic farmers, many of them struggle with the infrastructure needed to sell their crop for its true value. This is where High Quality Organics comes in. We’ve been able to help our Peruvian farmers not only gain market access to the U.S. but we’ve assisted with critical success factors like access to organic certification or certified organic seed. Our partnerships with our Peruvian farmers have truly gone beyond simple transactions and become transformational, allowing them to grow their business and better support their communities while increasing our supply capabilities. It’s an exciting time for Peru’s organic agriculture sector and we couldn’t be prouder to be a part of it. Below are a few highlights from a recent trip our Vice President of Supply Chain, Toby Eck, took in June. A blossoming organic chia seed field in Peru. Chia seed is an ancient seed growing in popularity for its heart-healthy omega-3 is used in baking, granola bars, smoothies and more. Here an organic farmer we’ve been working with is digging up a ginger sample in a sandy field. He is successfully growing many different crops using above-ground nutrition-irrigation system. This has transformed a completely agriculturally-useless region into vast fields of sustainably produced organic products. This picture shows just-picked paprika air-drying alongside a field. Not needing to transport or machine-dry the paprika provides significant savings for the farmer. This is one of HQO’s partners of three years, Santiago. He’s a first generation farmer that developed a passion for organic agriculture while in college. He has not only brought an abundance of agriculture to an otherwise barren area, but he is providing employment to several people in a very poor region of Peru. He grows jalapeño, paprika and more for HQO. Here’s a great example of the innovative spirit of our HQO partners. This is a sand field that can produce high-quality organic agriculture thanks to the above-ground irrigation and nutrient distribution system. This type of production agriculture is critical for food insecure places like the barren lands in remote Peru or Egypt. To learn more about High Quality Organics and the organic ingredients we supply from Peru and the other 30+ countries we work with, please contact us on our website, www.HQOrganics.com. 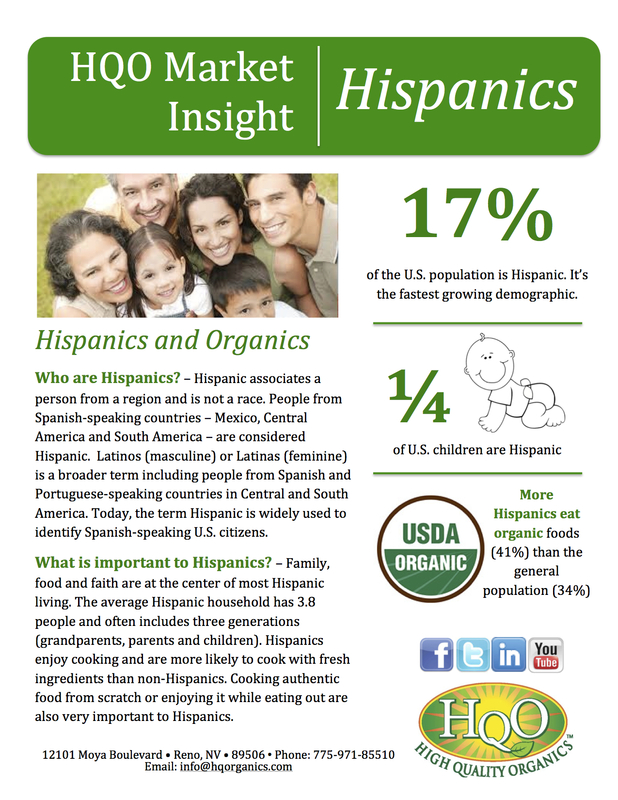 Hispanics are the fastest growing demographic in the U.S. Learn more about this important market opportunity in our latest white paper below. Click here to download the pdf. If you’re not sure how to create Hispanic-friendly flavors or products, we’d be happy to be your resource. High Quality Organics not only provides thousands of certified organic ingredients — many of which meet the flavor preferences of Hispanics — but our in-house R&D team (including 15-year herb and spice veteran Chef Dawn Wykoff) can help you create a custom blend or product that meats the needs of the rapidly growing Hispanic market. Contact us today at http://www.hqorganics.com or 775-971-8550.